Proceedings - The global economic long-term potential of modern biomass in a climate constrained world. EEEP - Can Bioenergy Assessments Deliver? 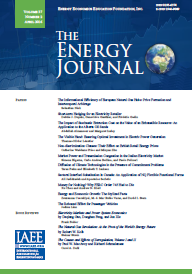 Published in Volume 35, Special Issue of The Quarterly Journal of the IAEE's Energy Economics Education Foundation.